Tool Box (Ctrl +T): To insert the Toolbox. Free-Form Select: Used to select an image with curves. You can trace the outline of the image. 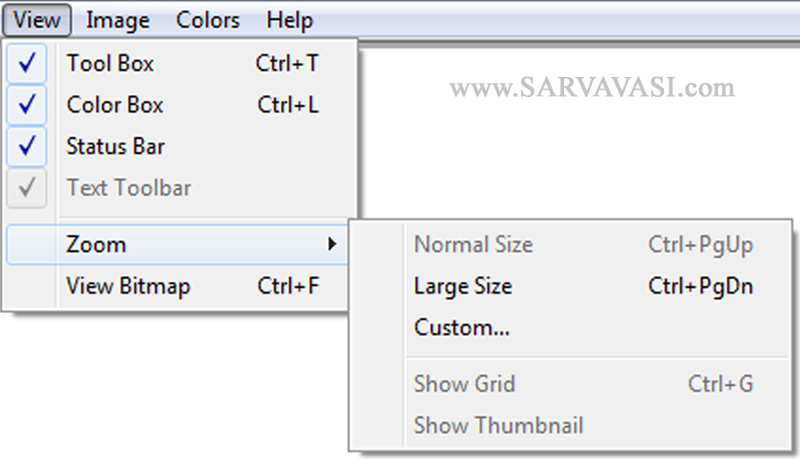 Select: Allows you to select images, but it only will select sections in square shape. Eraser/Color Eraser: Used to erase mistakes. Fill With Color: Is used to fill in areas with color. Pick Color: Select this icon and then place and click on any color on the page to select. Magnifier: Used to magnify any part of the page you select. Pencil: Is used for free-form writing or drawing. Brush: Brush is just like it sounds. Used in the same manner as a paint brush. Airbrush: Is like a can of spray piant, it will give that same kind of splattered effect. Text: Is to add text to pictures. Line: Is used to make straight lines for one point to another point. point. First, make your straight line point to point, then place the cursor anywhere on the line and stretch and curve to line until desired effect is achieved. Rectangle: Is used to make rectangular shapes. Polygon: Used to make polygons, start by making a straight line and clicking, continue this process until getting desired shape. Eclipse: Used for making circular shapes. Rounded Rectangles: Used the same way as rectangles, but with rounded corners. 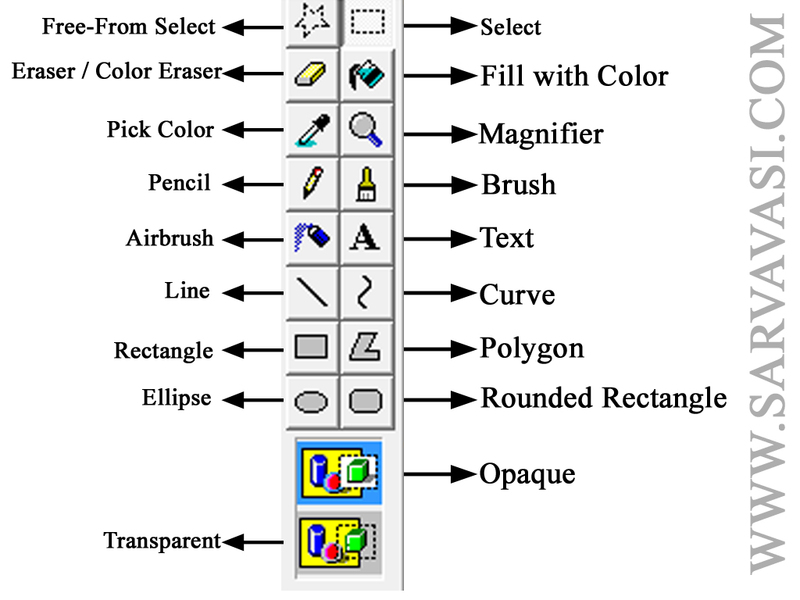 Opaque: Is used when you select a section or inserting text or image to crop(move) with either of the above "Selects". This will make the section selected solid. Transparent: Is used in the same way as the Opaque, except the selected image or text will be transparent. 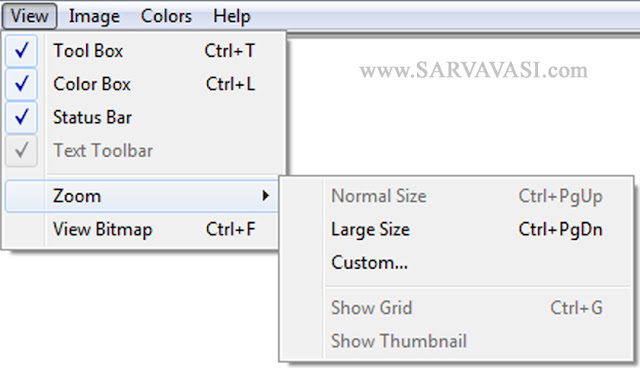 Color Box (Ctrl + L): To insert the Color Box. Status Bar: To Insert the Status Bar. Text Toolbar: To insert the Text Toolbar. Zoom: Normal Size (Ctrl +PgUp), Large Size (Ctrl+PgDn), Show Grid (Ctrl + G) . View Bitmap (Ctrl + F) : To view the full screen.